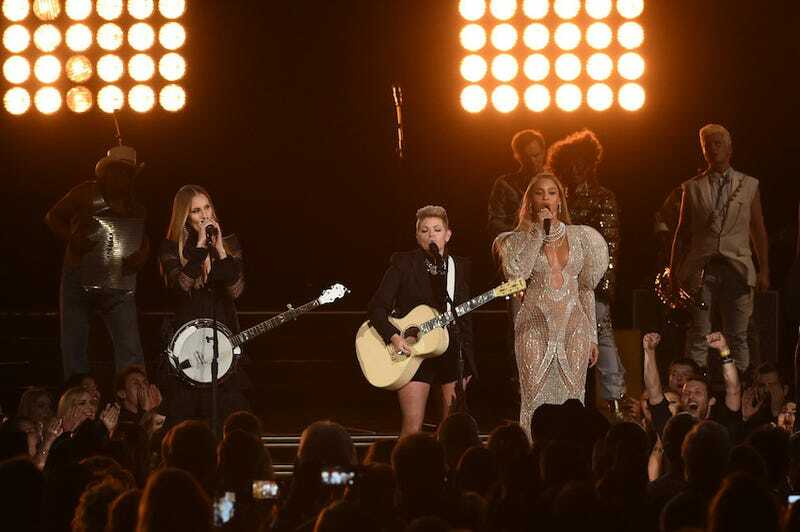 Listen up, dudes: Beyoncé’s C.M.A performance of “Daddy Lessons” was absent from the CMA’s website and social media because Beyoncé wanted it that way. That’s the story from C.M.A’s chief executive Sarah Trahern who responded to the outcry from eagle-eyed fans who noticed that the CMA’s website and various social media accounts were devoid of any pictures, video or mention of the performance –arguably one of the highlights of the show - the morning after. The morning after the awards, the clip was strangely absent from social media and the C.M.A website. Many speculated that this was due to the racist and unchill backlash during her performance from fans of “real country” who were very, very upset with her presence. While it doesn’t seem implausible, one must remember that above all, Beyoncé is in control of Beyoncé’s image. She’s the boss. If she wants you to see a performance or a photograph, you’ll just have to sit and wait until she’s ready. As per the Times, she provided her own photographer and approved just the one video. Sounds like the very same Beyoncé that kept freakin’ Lemonade under wraps for forever and released it on her terms. It’s not necessarily wrong to think that a quiet sort of racism was at play here, but think just a little bit harder about who we’re dealing with and this makes sense.